This late nineteenth century opera, Boris Godunov, looked back at Russias first great time of troubles in the early seventeenth century. As soaring tenors and sopranos anchored Western operas, the sonorous bass voice and unaccompanied chorus were the key elements for Musorgsky just as they had been in the worship services of the Russian Orthodox Church. There had been no instrumental music in the Church and no music at all for the masses outside of the sung liturgy itself. Musorgsky depicted in his version of the historic Boris many of the troubles faced by Tsar Alexander II in Musorgskys own time. Like Boris, Alexander II was a reformer who looked to the West. See Film footage of Boris Godunov. 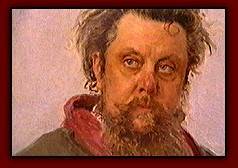 Musorgsky gave the Holy Fool a key role in Boris Godunov. In a scene unprecedented on the Russian stage, the fool accuses the Tsar of having murdered the young prince Dmitry who should be ruling in his place he refuses to pray for the Tsar. The ultimate defiant voice of the Russian people was the wandering, homeless holy fool who speaks prophetic truths to men of power. The fool provides a blessing as Old Believers bid farewell to one of their leaders being sent to exile. Musorgsky died in 1881 and was buried here in the graveyard of Petersburgs Alexander Nevsky Monastery. But before his death at the age of 42, he turned again to Russian history for what was to be his final opera. He immersed himself in primary documents and in Old Believer music.